This year I have a student who is far and above all the rest of my students in this area. He is literally finished with anything I give him in 5 minutes. I teach a lesson, practice with the students, assign the task and BAM, he is done!! Little Sally doesn't even have her name on the paper and he is finished! His "To Do Folder" is always empty, and no worksheet can hold him for more than a minute. I have an iPad and computers, but I am not sure what to put on there for him. So what I need to organize in my class is a Math Workshop, Math Tubs, something to meet his needs and all my other little guys. I feel overwhelmed and I just don't know where to begin. This is what I need from you. What do you do in your class?? What resources should I check out first? Books, websites, links to great Posts. I know Debbie Diller has a book out and I love her, but it is sooo pricey! Is it worth it?? I would love to hear all of your ideas and who or what I should google to help me get started. My math time is definitely in need of a Makeover!! I was going to suggest that book! I really think it would be worth it for you. It would definitely help you get organized. Do you have anyone you could borrow it from? I don't know anyone who has it, but I will put it on my Wishlist!! That can be such a challenge! A lot of the good math programs charge fees like dreambox, education city, mathletics, and brain pop. I've used xtramath.org which is free but designed not to be too time consuming. In the past I've borrowed a book from an older class for the child to work through. I found my second graders who were advanced loved learning to multiply early. The key I've found for my sanity is to find a few games for multiplication memorization that can be played over and over. That saved me from becoming overwhelmed with worksheets. Remember to pick something easy on you. Thanks Mercedes! I hadn't thought of getting him a Third Grade book. He has already mastered his multiplication facts and division facts!! I gave him a timed test for multiplication and he was finished before the other kids were done with their addition, lol! BUY THE BOOK!!! It will be well worth the money. 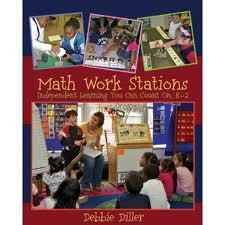 I go back to that book often for organizational ideas but also for ways to help manage my math centers. I like Mercedes idea of getting a math book from the next grade level and having them practice with it. If I were to do that, during my Work Station time, I would pull that students over, give them a small lesson on the chapter and see how they do with it on their own. It is always such a challenge to meet all your students needs. Good Luck and let us know what you decide and how it works out. This was the problem I had with a group of students last year...honestly, I wish I still had it! I thought I would be getting a ton of kids above grade-level again, so I prepped a ton of math station materials. Thank you so much for those links. I love Laura Candler! See this is why I put it out there. You guys will save me so much time!! Those are great! I am loving the task card idea! Have you tried Poppy's Toolbox? I have a whole free set. Download on TpT. It will challenge him, it has challenged my smartest mathematician! It's review, but a toughie & builds onto new concepts. One for every day of the week. Your all planned & done! If ya want more, let me know! Also, we do Study Island Math on the computer. They have common core everything, and games are an option, but your little guy can finish 2nd grade with a level of proficiency, then advanced, then move onto 3rd grade skills. Between Poppy's independent work, then moving onto the computers, you won't hear from him! Ten Marks is a free program I am using in math. You can also try scootpad (I think it has math) it's also free. Could he be a tutor? He is so shy! He has spoken very little in my class all year, he does help the kids at his table though:) I downloaded Scootpad, but haven't done anything with it yet. I few years back I 'flipped' my many-lingual classroom to support interventions with my low kiddos. Ideally, it was to support my daily one-to-one (RTI) time with them, but also increase math talk and independent, "Yes little ones I am not the only teacher in the classroom - You Are Too!" atmosphere. We use Math Expressions which seems to be an amazing bilingual resource which really supports second language (not just those who truly are second language, but low SES kiddos with limited language exposure outside of the school). It follows a GRR model. 5-15 minute whole group lesson, then 15 group work interaction (student teachers teaching students, and then those students reteaching others). Finally, there is an independent practice that they are able to do. (I use the homework from our book for this since it is two pages and I could never expect them to do both, so one is for school and one for home.) After that, they have 'fast finishers' buckets. These buckets do change per chapter. There are reviews for my lows, then extensions for my highs but all deal exactly with what we are studying. If it is double digit addition, I look in the CCSS to see what that bridges into (in my 2nd grade, then again in 3rd). There are soo many amazing resources out there! It is easy to be inspired, though I try to keep it simple. So fast finishers are, READ MATH BOOKs... sometimes we forget the importance of the book study. Recently we did counting coins and I put several history of money books in which were adored! MATH BOOGLE JR which the dice can be used for 2 or 3 or 4 digit addition or creating your own double digit addition as well as with my lows with the number recognition / ordering. I have found many of these games at GoodWill which have allowed me to hoard them. MATH FLASH CARDS using cubes or counters that match the holiday, I usually purchase the erasers from Target or Walmart $1 spots. They can then write their own story problems to match. JENGA addition, subtraction, multiplication. I have them all out, even though I have not taught multiplication, they love it. (I have a grid that they can reference for those who do not know). MONEY Whats in the wallet (premade wallets where they have to count the total coints. MONEY pinch or scoot. Depending on their level of mastery they pinch or scoop. Once done, they sort then count. After that, they write a story problem with their money in their math journal. ICE BREAKERS is the one that we have been practicing lately, I have a money addition (practicing saying dollar amounts vs cents), addition, subtraction or multiplication. I could go on and on.. there are many more easy things that they adore!! Each of the CCSS in my class has a bin where I store my games/manipulatives that I make find. The big games go into a cupboard that they kids are allowed to dig into freely after school during the boys/girls club with me. I find lots of things from the thrift stores around town to support my teaching habit (which makes me cringe just a little bit less if I did not spend top dollar on them and they break/disappear). Wow Katie, can you come and work with me for a few weeks, lol!! I have some math games in my class, but definitely not enough. So many ideas, thank you!! PS... either purchase Debbie Dillers Book... OR find the string of blogs that did a book review and posted ideas from all the chapters. I.N.S.P.I.R.I.N.G.... literally, I started to repurpose, organize and toss my math closet that night! I was having the same problem. I do 30 minutes of direct Math instruction, then the kiddos do Math centers. During the Math center time - I pull the kids that need extra one on one instruction. I love it. My rocket kids help the other kiddos during the center time - they love it and I have been cloned. Try Khan Academy on the computer! It can help teach "lessons" above and beyond, and it's totally free. I also really like Marcy Cook math materials for enrichment and working on deeper number sense without necessarily pushing into higher grade level stuff. I know of the Khan academy, but have never hear of Marcy Cook. Thank you Jenny I will check both of those out! I think I have an extra copy of the Math Stations. Wanna work out a trade to your store?